That man is a cookie fiend, but the cookies he was eating when he wrote that are especially delicious. They are made from a recipe I created by altering a recipe I’d already created. The first recipe calls for sorghum, teff, buckwheat, and mesquite flours. One day, maybe six months ago, when I had a craving for the unique and marvelous taste of mesquite, I began pulling out my flours to make the original cookies . . . but I discovered I was out of buckwheat. Then I noticed a package of Bob’s Red Mill gluten-free flour mix that had been opened but barely used. I decided to try the recipe using Bob’s in lieu of the teff, buckwheat, and sorghum. And honestly? Even though the batter itself didn’t taste as good as the first version (Bob’s has the tin-like beany taste in the flour), when the cookies were baked, the beany flavor evaporated, and I thought the finished product was better than the original. After I made the new variety, I ate a couple and put the rest in the freezer—an action that I usually take with cookies to avoid the on-the-counter incessant munching phenomenon. When I popped by a friend’s apartment a few days later, I took her a couple of the frozen cookies, which she adored. Ever since then, she’s mentioned those cookies whenever I have prepared other foods around her. So when she had surgery a few days ago, I bought a bag of Bob’s Red Mill, pulled out a pack of mesquite flour, and got to work. She ate a couple of cookies with her pain pills. They certainly don’t make it all better, but every little bit helps. Put the oven racks in the top half of the oven. Preheat the oven to 350 degrees. If you’ve never used mesquite flour before, open the package and put your nose to it so that you can inhale it malty, nutty, chocolaty aroma. Combine the flours, baking soda, baking powder, and salt in a medium-sized bowl. Cream the shortening/ghee with the sugars and vanilla until well-mixed. Add the flax egg replacer, and mix well. Add the flour in three or four doses, mixing between each dose. Fold in the remaining ingredients. The batter should be mildly crumbly but should be easy to press or roll into small balls of dough. If you think the batter is too crumbly, add 1 tablespoon of water, mix the batter thoroughly, and test it again. Repeat if necessary. 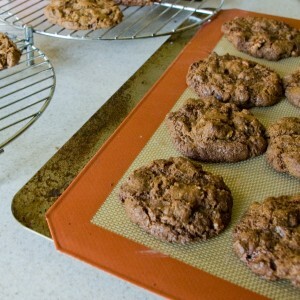 Line two cookie sheets with parchment paper or Silpats. Scoop or press about two tablespoons of dough into a ball or somewhat flattened ball. (The cookies seem to spread more if they’re made with shortening rather than ghee.) Place the cookies about two inches apart on the pans. Bake 15-20 minutes, or until cookies are fairly firm. (They will firm up more while they cool.) The cookies will be a bit darker than traditional chocolate chip cookies due to the flours in them. Remove the cookies from the oven, and transfer to a wire cooling rack after a couple of minutes. Makes a lot of cookies. My batch made about 36. You’re a doll, Sally. So sweet of you to bring cookies to your friend. If I ever have that experience I hope someone does something nice like that for me. The recipe looks divine. I am going to have to find some mesquite flour and try it. I know a lot of people don’t like the Bob’s Red Mill mix, but personally I found the same thing as you – if it cooks all the way through, you don’t have that nasty taste. The recipe sounds delicious. I have never used mesquite flour before, but I think I am going to have to give these a try! Okay, now I’m going to have to buy some mesquite flour and try these only I think I’ll skip Mr. Bob’s nasty bean flour and my stomach will thank me. What really struck me is that you don’t use xanthan gum or another binder. Does the egg replacer help or is it really not necessary in cookies as I’ve heard some others say? That’s a really important question because besides costing the moon it’s pretty gummy and nasty. I’ve tried psyllium and chia seeds to bind cookies recently and the flavor is just too strong. So thanks for posting these, that mesquite flour really sounds intriguing. Hannah & Thomas–Thanks! I hope you will try them and report back. Can I use ghee as a replacement for butter 1:1 in a cookie recipe? Are there other modifications that are necessary? I’ve seen this question asked many places on the internet, and at best, the discussions are one “I think…” after another. I want someone who actually knows, and I think you may be the person. My son was just dx with a casein allergy – so I can use ghee, but not butter… He is convinced he’s never going to have anything tasty again, so I was hoping to try a favorite recipe or two with ghee, but I don’t want to prove him right by having the recipes not turn out at all… KWIM. I appreciate your blog and your willingness to share what you’ve learned with others. Jennifer–Generally, yes, you can use ghee as a 1:1 replacement for butter in a cookie recipe. Extra virgin coconut oil (warmed to between 65 and 68 degrees for softening) and soy-free Spectrum organic shortening are also good options. You may find your cookies spread a bit more or less depending on the fat options you use. It’s generally a good idea to refrigerate the cookie dough for anywhere between 15 minutes and several hours when you are making gf, cf cookies. I meant between 75 and 78 degrees for the coconut oil. Sally, thank you so much for your reply! Finally, someone who knows what she’s talking about and isn’t just guessing at an answer for the sake of answering!